(l-r) QI researchers Jessica Block and Ran Goldblatt of the Big Pixel Initiative, with Global Policy and Strategy grad student Karla Yee-Amezaga in front of the Qualcomm Institute's Vroom display system. In the School of Global Policy and Strategy’s advanced spatial analysis class, students are first given an overview of remote sensing and mapmaking. They study how to build databases, design maps and perform remote analysis. 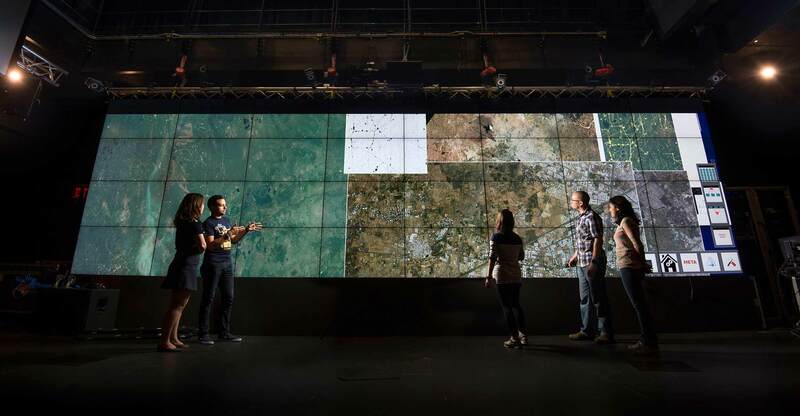 Big Pixel Initiative postdoctoral researcher Ran Goldblatt, who teaches the class, said the demand for professionals with advanced Geographic Information Systems, or GIS, knowledge is definitely going to increase. That’s because we use GIS every day. It’s used in the GPS function on our smartphones to show us where we are and what’s around us. It’s used in tracking and positioning emergency vehicles. It’s used by retailers and insurance companies to monitor shoppers and calculate prices. And it’s used by urban planners and policymakers to better understand the consequences of new infrastructure and regulations at both local and global scales. GIS deals with capturing and understanding geographic, or spatial, data, and is essential to understanding most aspects of our everyday life. Learning how to manipulate this huge amount of information—for the Big Pixel Initiative, high-resolution images with additional spatial data—is crucial to working in the future. The United States Department of Labor says GIS-related jobs are projected to grow by 29 percent in six years, much faster than the average 11 percent for all other occupations. 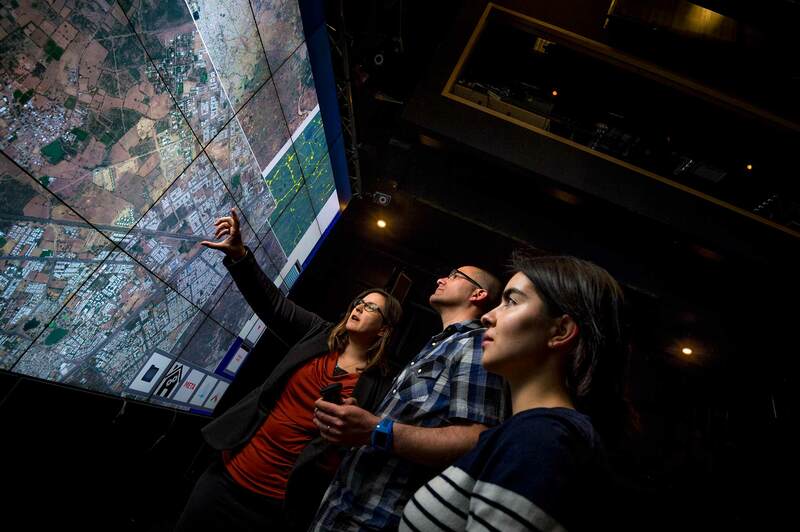 Led by Hanson and Qualcomm Institute research scientist Albert Yu-Min Lin, the Big Pixel Initiative’s mission is to develop advanced geospatial capacity to address the world’s greatest challenges. Anthropologist Thomas Levy of the Division of Social Sciences applies remote sensing analysis for archeological research, David Kline of Scripps Institution of Oceanography is mapping coral bleaching, and Jennifer Burney of the School of Global Policy and Strategy is developing methods to assess ecosystems in semi-arid regions. These projects are the perfect lab for students to learn how to conduct research, Goldblatt said. The initiative was launched in 2015 by unique, two-year access to DigitalGlobe Foundation data, and then expanded to include analysis on the new Google Earth Engine platform. In all, there are 10 projects currently underway, in addition to the courses in advanced spatial analysis. Big Pixel Initiative research assistants Di Dal and Alexis Rivera-Ballesteros watch as Karla Yee-Amezaga, Ran Goldblatt and Stephanie Vallarino study high-resolution satellite images. The student’s final projects in Goldblatt`s class were far-reaching and diverse, he said, demonstrating that remote sensing analysis is fundamental for research in almost any discipline: ecology, economics, human rights, urban and regional planning, archeology and more. Di Dai studied urbanization in India and Karl Rubio looked at the impact of climate change on fire risk in California. William Honaker evaluated foreign investment in North Korea, and Brady Liss, an anthropology graduate student, tested the potential role of Google Earth Engine in archeological research, identifying sites in the Faynan region of Southern Jordan. Goldblatt is clear he is not teaching students how to maneuver Google’s product, but rather how to use existing data to provide solutions to global issues they are passionate about. These skills, he said, are lifelong, and tremendously valuable. Alexis Rivera-Ballesteros, a Global Policy and Strategy student earning his Master of International Affairs, outlined prospective wind-farm locations in Mexico for his final project. In doing so, not only is Rivera-Ballesteros addressing current issues, but he is also setting himself up for a successful future. He said he intends to use this final paper in job interviews in the nonprofit sector after graduation. Originally from Mexico, Rivera-Ballesteros has focused his learning on energy, economic development and business. He said he tries to link his studies to his native country, looking for ways to help its development. Understanding the basic concepts of economics, he has been looking for different ways to link the public and private sectors to create benefits for the greater society. “The use of these tools has opened a new horizon for me that I never thought about. I discovered a new passion in me,” he said. Goldblatt said Rivera-Ballesteros was successful in his project because he was asking the right questions, which led him to finding the correct data and, ultimately, combining that data into the right formula for solving a problem. It’s why Goldblatt encourages the students to investigate issues they care about, and why Rivera-Ballesteros will have many options when he graduates from UC San Diego this year.